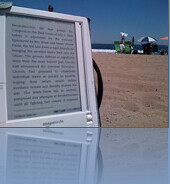 The Kindle 2 has been our digital media gadget of choice at the GeekTonic home these past two weeks. While not our normal TV or Audio-based media gadget of discussion at GeekTonic, the Kindle 2 eBook reader by Amazon.com fits in very nicely with its convenient, easy to use digital book reading capabilities. Earlier this week, Len Edgerly asked me to join him for a segment of his popular Kindle-Podcast, the Kindle Chronicles. In the interview Len asks me about my experiences with the new Kindle 2. If you have any interest in eBook readers or the Amazon Kindle readers, the Kindle Chronicles is the Podcast to subscribe to. I've been listening to it for several months now and look forward to each week's podcast. Len does a great job of mixing in Kindle-related news, tips and tricks and an interesting interview in nearly each podcast. Highly recommended.